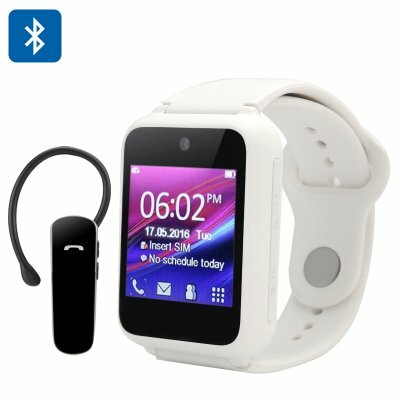 Successfully Added Ken Xin Da S9 Smart Phone Watch - Quad Band, 1.54-Inch Touch Screen, Camera, Bluetooth 2.0 Headset (White) to your Shopping Cart. Need to stay in touch with friends, family, and colleagues, but find yourself unable to work with the average phone? Don't worry – the Ken Xin Da S9 standalone watch phone is just what you need! The S9 is a smart wearable that lets you handle calls and text messages without the need to pair with a separate phone. Just slip in a SIM card, and you're good to go! This makes it an excellent wearable for outdoorsmen, shop workers, field technicians, and other situations where wearables are more convenient to work with than phones or tablets. The best part is that the S9 not only comes with its own Bluetooth headset, and is also capable of working with the four major radio frequencies around the world. This lets you bring the S9 anywhere you want, assured in the fact that it'll be able to connect with any major carrier in your country of choice! The S9 comes with a nifty 0.3MP camera of its own. This means you can snap serviceable photos or record decent video footage. Slot in an SD card of up to 16 gigabytes of storage, and you'll have the storage you need to capture all sorts of media for personal or professional use! Then there are the extra features that give the S9 a bit more utility, especially in more practical settings. The built-in calendar app lets you keep track of all your important events, the alarm makes sure you get to said events on time, and the calculator lets you crunch numbers while on the go.Not bad for a nifty wearable you slap on your wrist! Speaking of nifty, you get all these features without breaking your bank account. The S9 was designed from the ground up to be an affordable standalone smart watch that you can carry around – a solid, reliable partner to keep you connected while on the go! TheKen Xin Da S9 smart watch phone whitecomes with a 12-month warranty, brought to you by the leader in electronic devices as well as wholesale smart watches..